Samsung has announced a new deal for its Samsung’s latest Galaxy Note8 smartphone. The deal is Samsung offering a free Galaxy Tab A 8(Smoky blue color)” with unlocked Samsung Galaxy Note8 smartphone purchase. Galaxy Tab A 8 is currently going on sale for around $200. This deal is for limited time only. 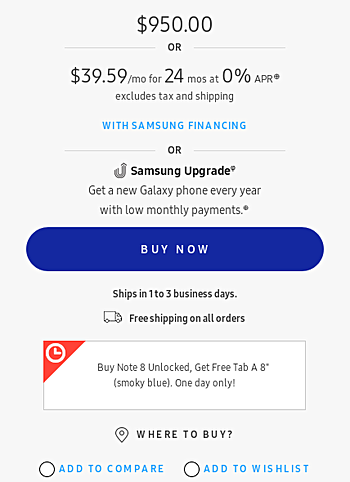 Unlocked Samsung galaxy Note 8 cost $950 or $39.59/mo for 24 mos at 0% APR(Excludes Tax and Shipping). Also, as already mentioned, it’s a limited time deal, ending today. So those interested in availing it may have to act really fast.